SNYFGP has helped to organize 2 important events in the Capital District. Please help spread the word and plan to attend. On September 8th, four days before the start of the Global Climate Action Summit in San Francisco, California, and two months before the U.S. midterm elections, people from across the country and around the world will take to the streets to demand bold action on climate change. Globally the mobilization is called “Rise for Climate,” where advocates plan to send a clear message to governments through distributed actions in towns, institutions, cities to push forward real climate action. Click here for a one minute video on why people think this is important. 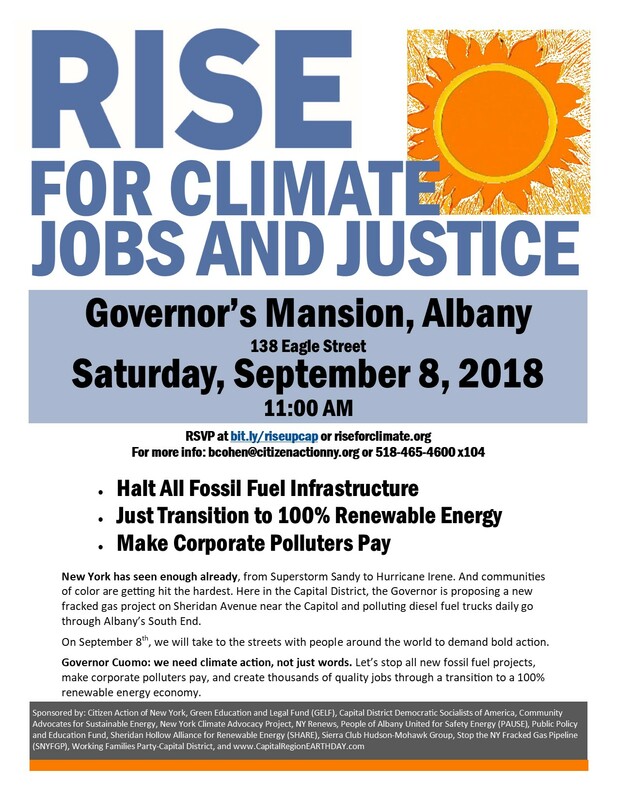 Rise for Climate Jobs and Justice Rally will be held Saturday, September 8 at 11:00 at the Governor’s mansion on Eagle St in Albany. This is part of a Global Day of Action calling for — No new fossil fuels – 100 % renewable energy – make corporate polluters pay – and the Capital District rally added the demand for NY to divest from fossil fuels. To register in advance (this helps us know how many people to expect) riseforclimate.org. Search #RiseForClimate for information about events happening around the world. We will call on Cuomo to take bold immediate climate action. Our future depends on it. Help deliver petitions to the governor to oppose the Sheridan Hollow Fracked Gas Power Plant, September 11 at 11:00, NYS Capitol. Deliver petitions to Gil Quiniones, NY Power Authority CEO at noon – 40 North Pearl St. Most of you know that Governor Cuomo has proposed to build a fracked gas powerplant in the densely populated neighborhood of Sheridan Hollow of Albany. We at SNYFGP were outraged when Kinder Morgan proposed to build a fracked gas compressor station in Nassau near about a dozen homes. We fought the plant and we won! Well… the Sheridan Hollow power plant is planned for a neighbored surrounded by hundreds of families who have already suffered from the ANSWERS plant in the 1980s and 1990s and the currently operating Sheridan Avenue Steam Plant. Many residents tell stories about how high rates of cancer have devastated their families. Let’s support these families in their fight for clean air for their community. There is no excuse to place a toxic plant in an urban neighborhood. Especially when renewable energy solutions are readily available. Please feel free to contact Ruth Foster, rmfoster@nycap.rr.com if you want more information about these events and local organizing against the Sheridan Hollow Power Plant. Join us at our next meeting to plan for the Fair. Wednesday, September 5th, 6-8 @ Nassau Library, 18 Church St, Nassau, NY 12123. Begin at 6 sharp & end by 8. We have 30 businesses/organizations registered already with many more expected to reach our capacity of 50 exhibitors. HELP WANTED: Contact beckyjmeier@gmail.com or 518-781-4686 if you can assist. We need people to help us run the smooth operation of the workshops offered at the Fair. We are looking for someone with a pickup truck to help us move a digital road sign(s) to advertise the Fair. Special thanks to Ken & Mary Scallon, Ken Stokem, Suzanne Pollard, Bruce Frishkoff, Ken Phelps, Rich Sinclair, Marcia Kammerer, Ruth Foster, Chris Dippolito (and others) who have already committed their time and energy to make this years’ Fair the best to date. Tennessee Gas Pipeline must prepare an Environmental Impact Report for its natural gas expansion projects in Agawam and Longmeadow, the Baker administration has ruled. Tennessee, a Kinder Morgan subsidiary, hopes to increase horsepower at its Agawam compressor station, build a new, 12-inch two-mile pipeline loop in Agawam, and construct a “West Longmeadow Meter Station,” a delivery gate which would feed a new Columbia Gas pipeline backbone to Springfield. Energy and environment secretary Matthew A. Beaton on Aug. 17 signed a certificate under the Massachusetts Environmental Protection Act, or MEPA, requiring better information about air pollution, rare species and wetlands, stream crossings, climate resiliency, construction protocols, and more. The Agawam project would alter 25 new acres, widen an existing right-of-way, cross five streams, affect wetlands, convert some farmland, and impact rare species habitat for two reptiles, according to documents. It would also have certain air quality and climate impacts, which the state said haven’t been adequately described.An earlier filing from Tennessee — an Extended Environmental Notification Form, or EENF — failed to compare baseline with proposed conditions when it comes to greenhouse gas emissions, and did not fully explain why certain alternatives, including energy efficiency, were rejected, the certificate states. Canada’s Federal Court of Appeal overturned the Kinder Morgan TransMountain pipeline approval. SNYFGP does not necessarily endorse all these solutions, but this is a fascinating look at how we might find solutions to climate change. 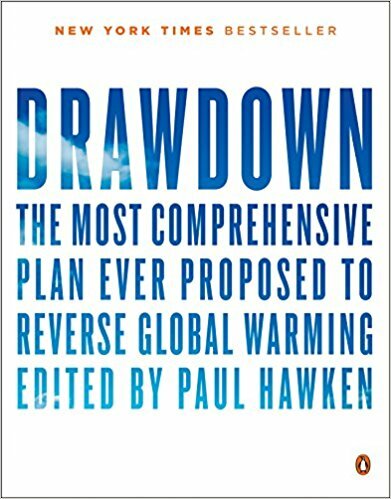 This table provides the top 20 results of the Plausible Scenario, which models the growth solutions on the Drawdown list based on a reasonable, but vigorous rate from 2020-2050. Results depicted represent a comparison to a reference case that assumes 2014 levels of adoption continue in proportion to the growth in global markets. NOTE: Energy Storage (utility-scale & distributed), Grid Flexibility, Microgrids, Net Zero Buildings, and Retrofitting were not modeled independently to avoid double counting impacts from other solutions. Environmental Impact Report needed for Tennessee Gas Pipeline projects in Agawam and Longmeadow, cont. In a victory for environmentalists, Tennessee must consider the Longmeadow meter station in its Agawam analysis. Tennessee had argued that the Longmeadow plan did not meet a threshold for state environmental review. “The meter station should be included,” according to the Aug. 17 certificate. Beaton asserted that projects in both towns will support expansion plans by a local gas utility, and are related. Tennessee must now submit detailed information about its plans in Longmeadow. The company must file a Draft Environmental Impact Report, or DEIR, before its final report is issued. A draft report opens the window for more public participation and input from state agencies. Tennessee had asked for permission to skip the draft report requirement, the MEPA office noted. Tennessee owns and manages the “200 Line,” a natural gas pipeline across the southern tier of Massachusetts. Along the interstate pipeline, it plans facilities on both sides of the Connecticut River to support expansion plans by Columbia Gas of Massachusetts. Columbia’s Greater Springfield Reliability Project would send a new pipeline to Springfield from Longmeadow, a new line from Agawam through West Springfield and Holyoke, replace an existing line between West Springfield and Springfield, and also boost capacity to Easthampton and Northampton, where natural gas moratoriums are now in place. In addition to Columbia, Holyoke Gas & Electric would gain more capacity. 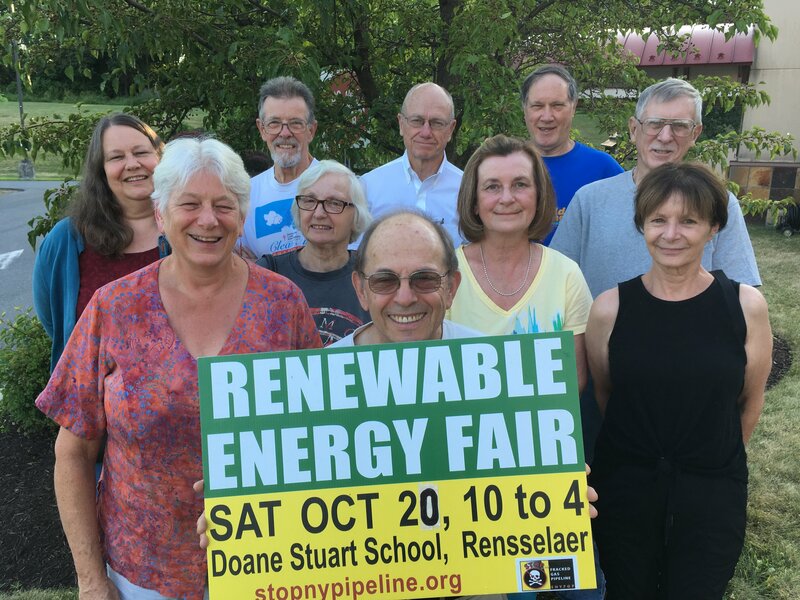 Groups opposing fossil fuels, including Berkshire Environmental Action Team and Massachusetts Pipeline Awareness Network, claim the moratoriums in Northampton and Easthampton could be lifted through other means, including energy efficiency. They also charge that government agencies and the industry encourage “pipeline overbuild” at the expense of climate and the environment. The climate groups argue that more natural gas use will increase greenhouse gas emissions that cause climate change — and prevent the state from achieving its court-ordered goals under the Global Warming Solutions Act. She said that methane is a potent driver of climate change, and that a lifecycle analysis from wellhead to burner tip would show that natural gas is as bad as coal when it comes to emissions. However, Steve Bryant, president of Columbia Gas, claims working with Tennessee on the Pioneer Valley expansion will actually reduce greenhouse gas emissions while helping the region. Kinder Morgan Approval Overturned in Canada, cont. This is a huge victory for Indigenous rights, for communities, and for our planet. Together, we can stop ALL dirty tar sands pipelines. Courageous pipeline fighters in Minnesota are currently facing off against the enormous Line 3 tar sands pipeline, including 30 people who were arrested yesterday taking direct action to urge the Governor to stop the project. We know how pipelines get stopped: by thousands of people standing together and taking action. You can help stop another tar sands pipeline – stand in solidarity with Indigenous water protectors and call the Governor of Minnesota today. Enbridge Energy secured their permits in June to move forward with the project – ignoring the input of tribal nations and climate science. Our friends and allies in Minnesota have asked us to stand with them and call their Governor, Mark Dayton, to thank him for his work opposing Line 3 so far and ask him to intervene and stop Line 3. This pipeline would transport more than 760,000 barrels of tar sands oil from Canada every day, crossing the Mississippi headwaters and forcing downstream pipeline expansions throughout the Midwest.1 It would be disastrous for the climate — and devastating for communities near and far. Can you take three minutes to call Governor Dayton today? We have a sample script and everything you need. Indigenous-led resistance is stopping the fossil fuel industry in its tracks. It’s been 521 days since Trump ‘approved’ Keystone XL, and it still hasn’t been built. Not even close. Pipeline fighters and Ojibwe Bands opposed to Line 3 filed legal challenges against the pipeline’s environmental review, and are building resistance on the ground and in communities. Can you call Minnesota’s Governor right now and let him know that you expect him to do everything in his power to ensure that the Line 3 tar sands pipeline is never built? With your help, our movement can stop the illegal and reckless approval of more pipeline projects. Together, we won the fight against the Kinder Morganpipeline, and together, we can win against the Line 3 pipeline and every other new fossil fuel project that is proposed.